During World War II, a top secret espionage program was led by the United States Navy to infiltrate the black programs of Nazi Germany that were successfully building antigravity space craft capable of interplanetary flight. Covert naval operatives were embedded inside a number of Nazi Germany’s advanced aerospace programs and tasked to report back what they had seen. This information was then relayed onto various U.S. corporations specifically contracted by the Navy that would begin designing and eventually building a variety of antigravity vehicles, including kilometer long space carriers. Tompkins first public appearance was on the Jeff Rense show on December 14, 2015 (also Dec 23 & Jan 6 – pt 2), where he describes some of his book’s disclosure filled content. 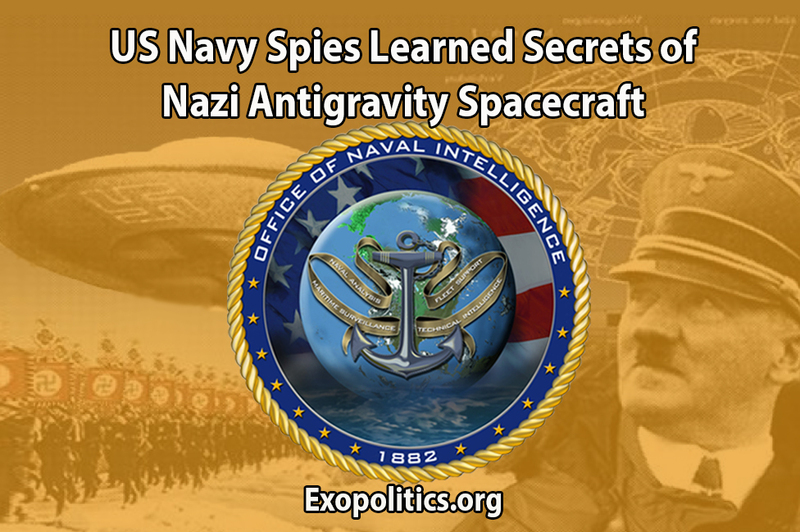 Tompkins went into detail about how he was recruited into the Navy’s covert espionage program during WWII to study and reverse engineer Nazi-designed antigravity space craft. Tompkins story begins in 1932, when he was only nine. He says he was taken by his father to the Navy’s deep water breakwater in Long Beach California where he began the first of many public tours of aircraft carriers, battleships, cruisers and destroyers, which were anchored. The public was not allowed to take photos of the ships whose gun placements and radar designs were still classified. Possessing a photographic memory, Tompkins says that he walked all around the ships and took notes of what he observed, and soon after began reproducing scaled models. Eight years later, Tompkins had built many flawlessly accurate detailed models of the navy ships he had seen, and his father was displaying them in a Hollywood Department store. After the Navy learned about the model ships in 1941, displaying top secret details, they interrogated both Tompkins and his father, and the models were withdrawn from public circulation. The Navy top brass were nevertheless greatly impressed by Tompkins remarkable talent. 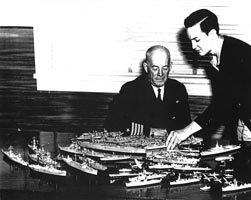 A March 26 article in the Evening Outlook newspaper of Santa Monica featured a photograph of Tompkins (now 17) showing some of his ship models to Navy Captain G.C. Gearing, Commandant of the 11th Naval District in San Diego. It is with considerable interest and pleasure that I, together with officers of my staff, examined several of the ship models. Craftsmanship such as you have evidenced shows that you are a keen student of detail and naval construction. Best of all, however, you are doing something worthwhile as a young American—you are helping to build into the American mind the importance of the nation’s first line of defense to each American, young and old. Tompkins abilities had come to the attention of the Navy’s senior leadership. This included the then Secretary of the Navy, James Forrestal, and Admiral Rick Obatta whose responsibilities, according to Tompkins, included covert intelligence projects run out of North Island Naval Air Station at San Diego. Though only a third class seaman, he replaced a Commander at North Island Naval Air Station in San Diego. In his December 14 interview on Rense, Tompkins claims that he participated and documented all meetings attended by Admiral Obatta, one or two Captains, and the naval operatives reporting on what they had observed in Nazi Germany. Tompkins subsequently told this writer on January 16 that there were 28 Naval operatives with the rank of Lieutenant used in the covert program. They all had German ancestry, which allowed them to easily infiltrate Nazi Germany. Tompkins’ mission was to reproduce the complex extraterrestrial data that was given to the Nazi SS, which were either described by the naval operatives or contained within the documents they possessed, and then take these reproductions to different corporate Navy contractors. The contractors would proceed to design, reproduce and test various elements of the anti-gravity spacecraft, which were at various stages of production in Nazi Germany facilities in Europe, South America and Antarctica. What the naval operatives were further reporting is astounding. Tompkins claims operatives revealed in the top secret debriefings that up to and during the World War II, there were two flying saucer programs under development. The first was a largely civilian effort that predated the Nazi rise to power in 1933, while the second was led by the Nazi SS. 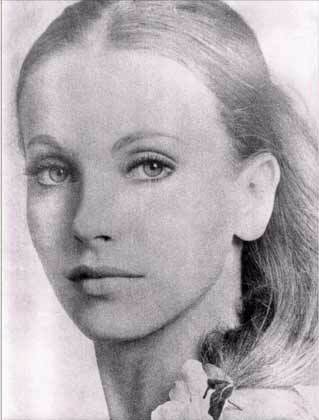 Tompkins said that the civilian German space program had been inspired by a Nordic group of extraterrestrials who were communicating through young female German mediums. The second program was assisted by a group of extraterrestrials called the Reptilians, who had reached secret agreements with Hitler. In 1939, Tompkins asserts that the Nazi SS was given the location of three large caverns in Antarctica by the Reptilians, and proceeded over time to move the bulk of the German secret space programs there. By 1942, when it became clear that the war was lost, the Nazi’s accelerated their efforts to relocate the best scientists, engineers and vital resources to Antarctica, and Argentinian caverns, through specially built submarines capable of carrying very large cargoes. Tompkins through the Naval operatives learned that the Germans achieved great success and failures in their space program efforts. Of particular note was the first space flight to Mars in late April 1945, which had a crew of 30, including three Japanese astronauts. This stunning achievement ended in disaster when the spacecraft crash landed, resulting in the death of the entire crew. After he reproduced the ship design information he had gained from the covert Navy operatives spying on the German space programs, Tompkins says he then took these designs to various top secret Naval development centers and corporate facilities. These included Douglas Aircraft Company at El Segundo and Santa Monica, Lockheed, North American aviation, and an underground Naval facility supported by Caltech at China Lake. Tompkins experience at Douglas with the two “Nordic secretaries” suggests that the U.S. Navy had reached a secret agreement with a friendly group of extraterrestrials in the early 1950s to develop their own space program. It would become the counter to the Nazi/German space program in Antarctica, which was being helped by Reptilian extraterrestrials. Tompkins story sounds incredible, but key elements have been verified by the book’s editor, Dr Bob Wood who first began investigating Tompkins’ information in 2009. Serendipitously, Dr Wood was employed with Douglas Aircraft (later McDonnell Douglas) over a 43 year period, and worked at Douglas at the same time as Tompkins, even though the two had never met prior to 2009. One day after I reported to a couple of VP’s on how we were doing, one of them asked me personally if I was doing anything interesting outside of my job. ‘You’re not going to believe this, but I’ve read about 50 books on UFOs’, I said, and ‘the amazing conclusion I have come to is that they are very real extraterrestrial craft’. The only thing that’s uncertain is whether we find out how they work before or after our competitor Lockheed. After a moment of silence one of them (VP) said, ‘how much would it cost to take a look at that question’? Therefore we started a project, quite low key to take a look at the question of how they work. Dr. Wood was able to corroborate the names of engineers, scientists and projects at Douglas, which Tompkins referred to. Tompkins was also able to supply documents that confirmed that he was a principal of a U.S. Navy project from 1942 to 1945, as he claimed, and that Douglas was interested in designs of kilometer long spacecraft carriers. The significance of Tompkins claims cannot be understated. They corroborate the key claims of a number of notable whistleblowers with alleged knowledge of secret space programs. In particular, Tompkins material adds substantive weight to the testimony of Corey Goode, whose groundbreaking claims were investigated in the book, Insiders Reveal Secret Space Programs and Extraterrestrial Alliances. According to Goode, he learned about the history of the secret space program he served on from “smart glass pads” that he was given access to during his covert service from 1987 to 2007. These smart glass pads contained intelligence briefings, which Goode later revealed in his testimony. The information closely corresponds to what Tompkins says he heard at the debriefings he participated in involving covert naval operatives working in Nazi Germany from 1942 to 1946. One of Goode’s key claims is that Nazi Germany had developed not one, but two flying saucer programs. The first was a civilian program led by Maria Orsic, a young woman with exceptional psychic gifts who established communications with aliens claiming to be from Aldebaran. This resulted in the design and building of the first flying saucer craft under the auspices of the Vril Society. Similarly, Tompkins claims that one of the German programs was a civilian program run by female psychics in communication with extraterrestrials. 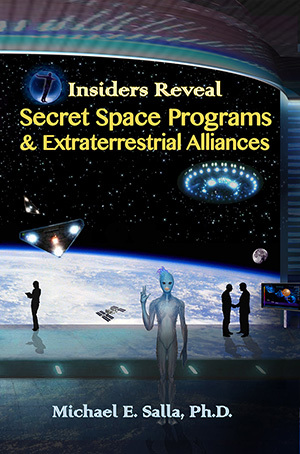 Tompkins confirmed to the writer on January 16, that the leader of this group was Maria Orsic as depicted on page 67 of Insiders Reveal Secret Space Programs and Extraterrestrial Alliances. Both Goode and Tompkins claim that the second space program was run by the Nazi SS. Furthermore, both Goode and Tompkins claim that the Germans relocated their most advanced space program assets to Antarctica and South America, prior to and during World War II. Tompkins book also corroborates Goode’s claim that the first successful missions to the Moon and Mars were undertaken by the German secret space programs in the early to mid-1940s. In addition, Tompkins, like Goode, claims that Operation Highjump was an unsuccessful naval military expedition to locate and destroy Nazi bases in Antarctica. 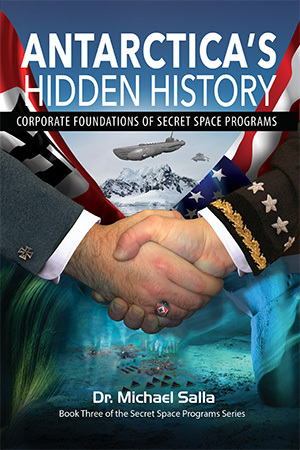 Tompkins claims are truly extraordinary revelations by a former employee of Douglas Aircraft Company, TRW Systems, and other aerospace companies working on classified programs for the U.S. Navy. The fact that his claims have attracted the support of Dr. Robert Wood, another former Douglas Aircraft employee, is highly significant. The drawings Tompkins has supplied in his book is documentary evidence in support of his claims that a secret space program was indeed developed by the U.S. Navy, as a result of espionage by its covert operatives, of what the Nazis had pioneered in their own highly classified antigravity technology programs prior to and up to the conclusion of World War II.